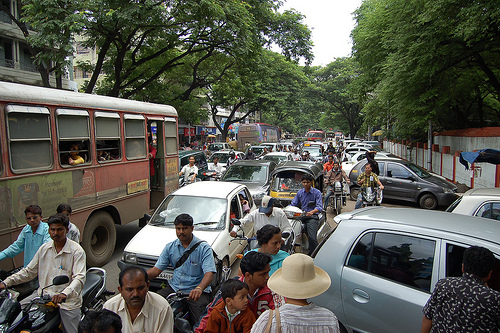 Cars, buses, motorbikes and rickshaws compete for space in Pune, India. Photo by Deadly Tedly. Every year, more people die from road traffic injuries in India than anywhere else in the world, and the toll shows no signs of abating, according to a recent New York Times article. In 2008, more than 118,000 people were killed on the roads, an increase of 40% from the previous year. Vulnerable road users – pedestrians and cyclists – are particularly at risk. India’s roads are notoriously congested, with cars competing for space with buses, motorcyles, bicycles, auto-rickshaws, pedestrians and the occasional cow. Enforcement of traffic laws is lax, and car ownership is booming thanks to the introduction of sub-$2,500 cars such as the Tata Nano, with others in the pipeline. The government is on a road-building spree as part of the National Highways Development Project, as road infrastructure is fast becoming a bottleneck to economic growth. However, without a concerted government effort to improve safety, India’s infrastructure development will come at the expense of its citizens’ lives. The public health community has begun focusing more attention on the problem of road safety. Late last year, Bloomberg Philanthropies launched the Road Safety in 10 Countries (RS10) project , providing $125 million to six organizations (including EMBARQ, the producer of this blog) to improve road safety in the 10 middle- and low-income countries that account for almost half of road traffic injuries worldwide. Speaking at the recent launch of the Regional Road Safety Report for the Americas at the Pan American Health Organization, Dr. Adnan Hyder of the Johns Hopkins Bloomberg School of Public Health pointed out that “road safety interventions are among the most cost-effective public health measures” that can be undertaken. Some simple road safety interventions that can significantly reduce road traffic injuries include better lighting on roads and crosswalks, barriers between vehicles and pedestrians, and enforcing the use of helmets and seatbelts. As India continues to invest in transportation infrastructure to fuel its economic growth, the government needs to ensure that roads are designed to provide safe mobility for all its citizens. As Dr. Etienne Krug of the World Health Organization points out in the New York Times article, road safety “requires political commitment of the highest level.” India’s government has acknowledged road safety as a major priority and has introduced legislation to create a national road safety board, encouraging first steps.